The Captur’s four car range includes the 0.9-litre TCe 90 and 1.5 dCi 90, as well as the brand new 1.2-litre TCe 120, mated to an EDC (Efficient Dual Clutch) transmission. It has one of the biggest luggage areas in its class - its dual height boot floor allows its 377-litre boot to increases to 455. With the rear seats folded that rises to 1235 litres. Equipment levels will be Expression, Expression+, Dynamique MediaNav and Dynamique S MediaNav. The entry-level Expression comes with 16-inch alloy wheels, 60/40 split and sliding rear seat bench, body coloured bumpers, cruise control, ECO mode (up to 10% fuel saving), ESC (Electronic Stability Control), ETC (Electronic Traction Control), front and rear electric windows, HSA (Hill Start Assist), speed limiter, and trip computer. Renault expects the Dynamique MediaNav to be the UK's best seller - and it's here that the personalisation options expand somewhat. You can even choose zipped seat covers, a chrome Colour Pack. Renault's MediaNav, the integrated multimedia tablet with seven-inch touchscreen, including Navteq Nav ‘n’ Go satellite navigation, 4x20W Arkamys radio, Bluetooth, USB and handsfree technology, is hoped to be a big draw in the showroom. 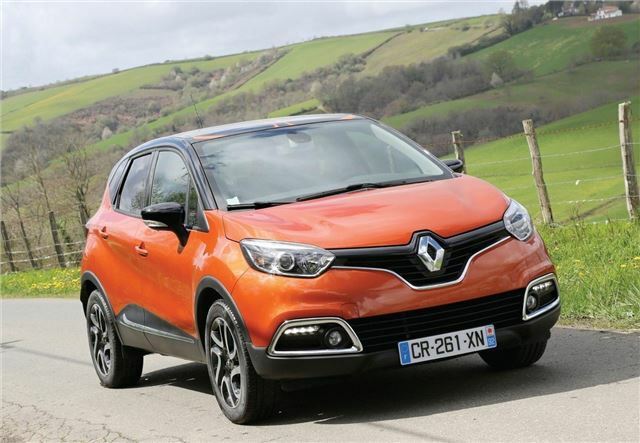 Captur also benefits from Renault 4+. The comprehensive package includes a four year/100,000 miles warranty, four year/48,000 miles free routine servicing, four years roadside cover and four years finance.